Elation has partnered with LabCorp to bring you our first bidirectional lab interface! With this feature turned on, you’ll be able to send orders to LabCorp straight from a patient’s chart, manage vendors and order sets within your settings, and more. ​Click here to view our LabCorp eOrdering Training Video. Once the bidirectional labs feature is turned on, you’ll find a new page in your Settings called Labs at the bottom of the Practice Settings section. The Lab Orders section will contain your custom Lab Order Sets. Lab Order is where you will add, edit, or remove order sets. This section is divided into subsections: order sets with compendiums and order sets without. We currently support structured lab order compendiums for three lab vendors: LabCorp, Diagnostic Laboratory Services - Hawaii (DLS), and Clinical Labs of Hawaii (CLH). If selected in the Lab Vendors section, these labs will be listed first in the Order Sets section. For these labs, when you are creating a Lab Order Set, we will return matching search results from the lab’s order compendium. Due to the nature of structured order compendiums, you will only be able to select from the lab’s tests and will not be able to select user-created lab tests. The second section is listed as “Other labs (without compendium)”. This is where you will find all the lab order sets created by your practice prior to this feature being turned on. You will be able to easily add new lab order sets to the either subsection by clicking the “+ Add Lab Order Set” button, then entering a name and the appropriate lab tests / diagnosis codes. **Please note: no two Order Sets can have the same name, regardless of if they are in different subsections. To edit or remove an existing Order Set, click on the Name - this will expand the Order Set and reveal the “edit” and “remove” links, as seen below. LabCorp requires quite a bit of information to be sent along with eOrders, so we’ve made a couple notable additions to the Patient Demographics section. Just below the Insurance section, you will notice the option to add a “Guarantor”, if not yourself. LabCorp requires that every eOrder sent to them, which is being billed to a patient or insurance, must have guarantor information. To ensure your orders are accepted, we’ve added red asterisks next to the fields which are required by LabCorp. Once the Guarantor information has been added, it will show in the Patient Demographics as a link which you can click to edit, if need be. The other addition to be aware of is we’ve added a “Coverage” type when adding or editing insurance. You can now select between Commercial, Medicare, Medicaid, and Worker’s Compensation from the “Coverage” dropdown at the top of the “Edit Patient Insurance” box. It's important to note that LabCorp *requires* more in-depth insurance information. 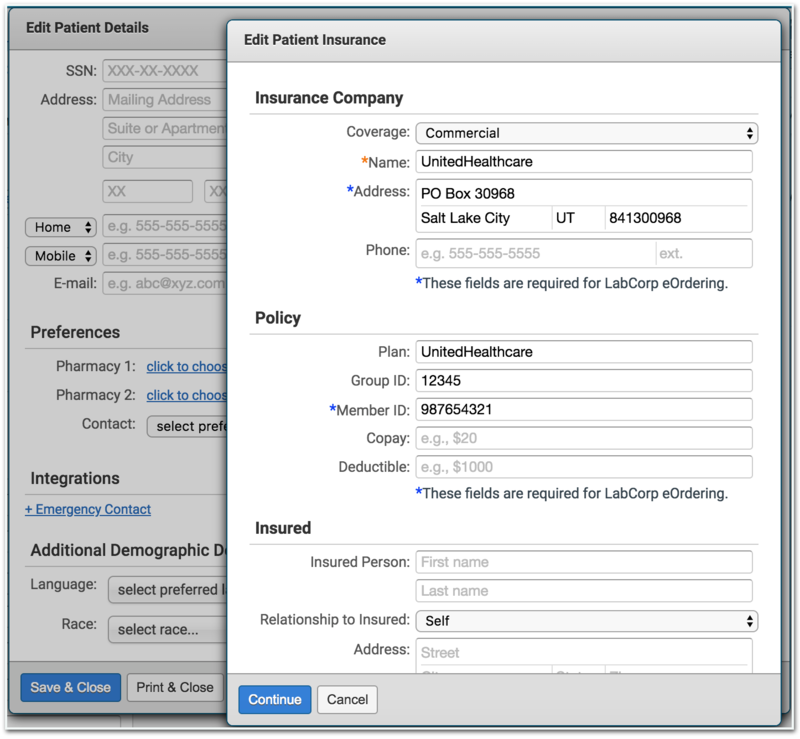 All required fields show up with a blue asterisk next to them when editing insurance information from the Patient Demographics, as seen in the screenshot above. The Lab Order Form will be found in the same place it was prior to turning on the bidirectional labs feature: click on Orders → Lab Order. To get started, select a Lab and Site from their respective dropdowns. You’ll notice that the only lab selections available are your preferred labs that were added in the Lab Vendors section of your settings. Once a lab vendor has been selected, the site dropdown will switch to showing all locations for that lab vendor. We also show “In House Draw” as an option for lab orders where a specimen was collected on site. If you select “In House Draw”, you will have the option of documenting the Collection Time by clicking “more…”. Please be sure to use specimen label paper when printing In House Draw orders. The Tests section will show different options in the dropdown depending on whether the lab chosen has a structured order compendium. If you choose LabCorp, DLS, or CLH, the tests will be from the vendor’s compendium and order sets from the vendor’s section in your Settings. There will be no user-created lab tests or order sets available. Additionally, we now support LabCorp’s order compendium Ask at Order Entry (AOE) questions. For certain tests, the lab requires answers to questions in order to effectively process testing on a specimen. If you select a test that contains AOE questions, we will automatically the appropriate questions and answer formats for the selected test(s). You are not required to answer the AOE questions, but please note that if you leave the questions unanswered, LabCorp will likely contact you to confirm the missing details. If you choose a lab that has no order compendium or neglect to select a lab at all, the Test section will show results from your user-created lab tests and the “Other” lab order sets section in your Settings. The Diagnosis will auto-populate if an order set with an associated Dx is selected, or you can utilize our search function by typing out the name of the problem or Dx and selecting from the returned results. You can remove Tests or Diagnoses by hovering your mouse over the line item and clicking the X. You will also be able to save lab order sets straight from the order form by clicking on the “Save as Order Set” link. With the bidirectional labs feature on, you will now have access to a “Bill Type” dropdown by clicking the “more…” link. The dropdown shows LabCorp’s required selection options. Based on the selected Bill Type, Elation will send details in the eOrder and requisition form to the lab. These may include insurance, guarantor, or next of kin information. 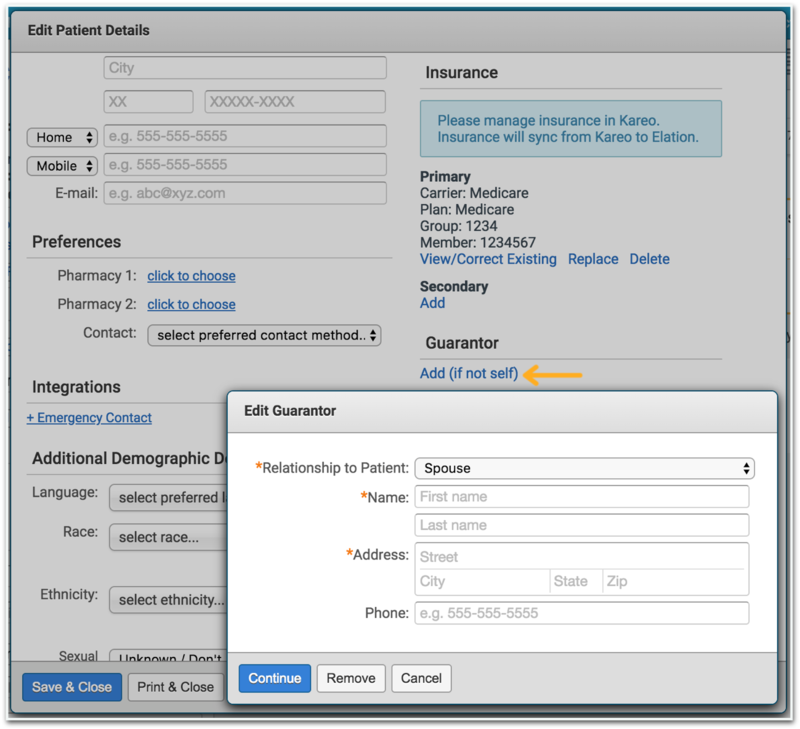 If the patient has an insurance filled out in their Patient Demographics, the Bill Type will default to “Third Party (eg. Insurance)”. If Third Party (e.g. Insurance) is selected for a patient’s Bill Type, you will notice a blue “Check Medicare Eligibility” link appear. This link will show up any time Third Party is selected, regardless of whether or not the patient chart has Medicare insurance on file. When the link is clicked, Elation will run a quick check with LabCorp’s ABN service to see if the patient has Medicare Coverage for the lab tests and diagnosis(es) selected in the order. If the patient is not covered, we will display the estimated cost for the tests and generate an printable Advanced Beneficiary Notice (ABN) form. Being aware of outstanding orders is vital to prioritize patient outreach efforts and inform future care plans, which is why we’ve incorporated an optional reminders into our order forms. Reminders appear in Practice Home under Reminders and the Requiring Actions section of the Patient Chart. To set a Reminder, assign which active provider, staff member, or group at your practice you’d like to receive the reminder, then select the desired reminder date. For LabCorp orders, once all the necessary information has been added to your order form, you will be given the option to eOrder or eOrder & Print. The option to eOrder will not be available for any other labs at this time. If a warning box surfaces stating "LabCorp requires additional insurance information to eOrder", you are missing one or more of the required insurance fields and will not have the ability to eOrder - you will only be given the option to "Print & Close". Once the information has been added, the warning box will disappear and you will have the option to "eOrder" or "eOrder & Print" again. 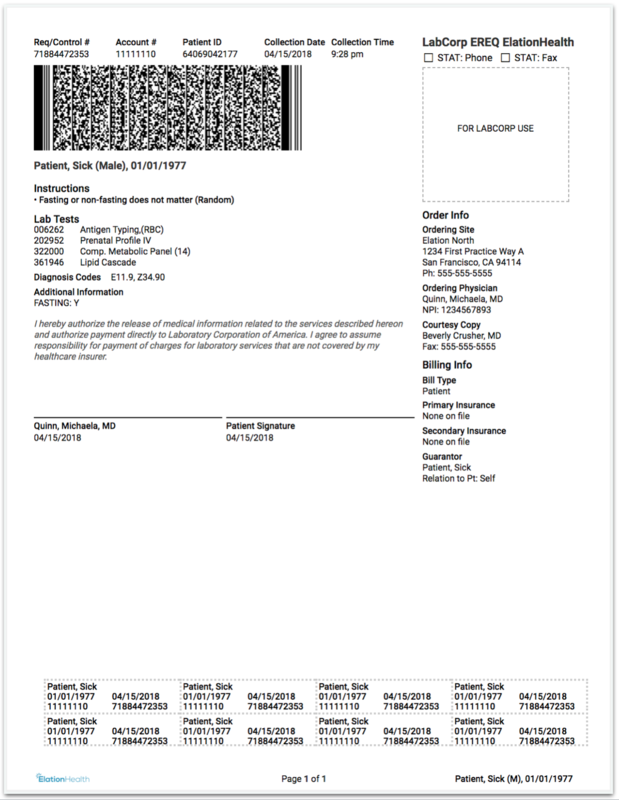 Below is a sample of what your printed LabCorp orders will look like. Note the specimen label section which is included for “In House Draw” lab orders where a specimen was collected on site. How can I create a lab order for patients without insurance? If you choose "Patient Billing" then you do not have to enter insurance information for the patient. The patient would then be expected to pay at the lab center.